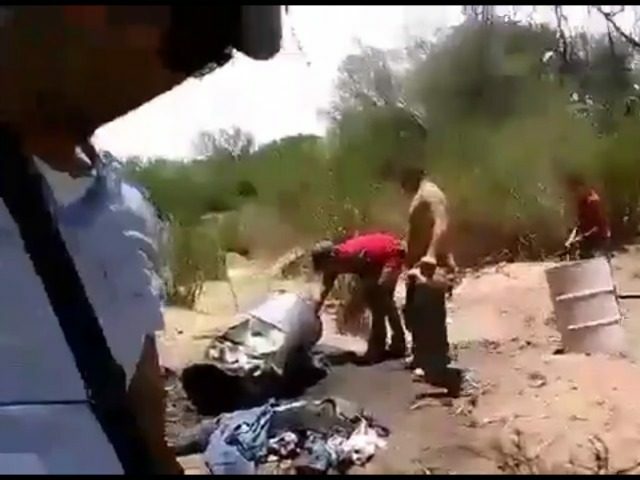 MATAMOROS, Tamaulipas — A leaked video obtained by the Breitbart Texas shows a crew of Gulf Cartel gunmen preparing to incinerate dozens of murdered victims. They are also seen playing soccer with a human head. Earlier this year, Breitbart Texas reported on a series of mass graves and drums that were found by authorities in the rural community known as La Bartolina. The rural community is near the highway that connects Matamoros to the Gulf of Mexico. That area was known by residents as La Cocina or “The Kitchen”, which was used as an incineration area by the Gulf Cartel in this city. Just days after the initial reporting, the Tamaulipas government under a previous administration tried to cover up the find by claiming that investigators could not tell the difference between human remains and animal bones. At the time, Breitbart Texas was able to track down a former Gulf Cartel hitman who had worked in La Cocina and claimed that close to 500 victims were incinerated in the area. The gunman stated that relatives would not get many answers since a properly “cooked” body turns mostly into ash. In early February, Breitbart Texas released the results of a three month investigation into how members of the Los Zetas cartel were able to kidnap, murder and incinerate approximately 300 victims, including women and children. Half of the victims in that case were incinerated inside the Piedras Negras prison while the rest were incinerated in clandestine crematoriums. Months after Breitbart Texas’ initial report, the Coahuila government has now arrested a small town mayor and a few minor players of the Los Zetas cartel. Coahuila authorities have not gone after high-ranking public officials, including a former governor who has been implicated in connection with Los Zetas. Editor’s Note: Breitbart Texas traveled to the Mexican States of Tamaulipas, Coahuila and Nuevo León to recruit citizen journalists willing to risk their lives and expose the cartels silencing their communities. The writers would face certain death at the hands of the various cartels that operate in those areas including the Gulf Cartel and Los Zetas if a pseudonym were not used. Breitbart Texas’ Cartel Chronicles are published in both English and in their original Spanish. This article was written by”M.A. Navarro” from Ciudad Victoria, Tamaulipas, “J.M. Martinez” form Piedras Negras, Coahuila and Breitbart Texas’ Ildefonso Ortiz.